In this week’s Pet Talk, Maneka talks about depression in dogs and post operation requirements after neutering pet? What is fish food made of? Dry food: It includes flakes, pellets and sticks. Flakes and sticks are often low in fibre and can cause constipation, therefore the food should be supplemented with vegetables; Freeze dried: blood worms and krill; Frozen: Zooplankton, fish, whitebait, squid, clams, mussels and prawns; Live foods: Earthworms, river shrimp and large insects. What are the post operation requirements after neutering your pet? The healing process takes up to 7-10 days. Any strenuous activity could disrupt the healing process. It is very important that the activity is limited during the healing process. The animal must be kept indoors, clean, dry, and warm. No running, jumping, playing, swimming, or other strenuous activity during the 7-10 day recovery period. They are not to be bathed or groomed during the recovery period. When outdoors, dogs should be on a leash and taken for short walks only, for next 10 days. Make sure your cat has a comfortable spot to sleep in a confined, secure, quiet place. Once she’s settled, she’s likely to sleep it off and will be fine upon awakening. Your pet may have poor balance. This will make climbing stairs, or getting in and out of the car, more difficult than usual, so be ready to assist. Help your dog in and out of the car, as sudden movements can damage his stitches. Lift the dog by wrapping your arms around the dog’s chest/front legs and rear/back legs. The veterinary surgeon must cut through the dog’s abdominal wall muscles during the procedure, making the entire torso very sensitive and tender, so pick up in a way that you do not stretch the skin and abdominal muscles. Your pet may be groggy when you get home, experiencing a “hang-over” from the anaesthesia. Your pet may sleep much more than normal, for 18-24 hours following surgery. He may be a little agitated or aggressive due to the after-effects of anaesthesia. Avoid handling the animal too much as he/she may try to bite or scratch you. Post-Operative Instructions: The First Night — Food and water: Start with a very small (1/8 cup) meal of your pet’s regular food. Offer a small (1/4 cup) amount of water or ice cubes. If this stays down for an hour, then offer another small meal and drink. Do not allow your pet to “guzzle” unlimited water or food – this often leads to stomach upset. If your pet has no interest in food or water the first night after surgery, this is not a cause for concern. If he or she does not eat the day following surgery, get back to the vet immediately. It is important to monitor your pet’s incision closely – check it at least once a day for the next 2 weeks. Mild swelling, bruising, and even a little pinkish discharge, can all be normal for the first 24 hours. After that, the incision should look nothing but better from there. Any redness, discharge, or discomfort is cause for concern. Things to Keep in Mind for the Next 14 Days: Do not let your pet lick the incision. It it is VITAL that you purchase a collar and put it on your pet immediately. Dogs should be leash-walked only (no running loose) for one week after surgery. Female cats should be kept indoors for one week. Excess activity can lead to swelling at the incision, or tearing of the sutures and opening of the incision. No baths or swimming for one week after surgery. There is no need to clean the incision with anything, and do not apply any ointments, bandages, or medications. Vomiting is the most common post-anaesthesia complication. Vomiting once or twice the night after surgery is very normal. Shaking or trembling for the first night home can be a normal side effect of the anaesthesia wearing off. It should resolve completely within 24 hours. If pain medication is sent home, it is to be started the next day. All animals receive pain medication during surgery that will last the first 24 hours. Neither Metacam nor Carpofen have any sedative effects. Tramadol can cause mild sedation. If your pet is vomiting, no pain medications should be given. A small, firm, knuckle-sized swelling at the incision can be a normal reaction, as the suture knot under the skin dissolves. It should be completely gone within a month of surgery. Check the incision twice daily. It may be slightly red and there may be minor swelling in the day or two following surgery. A small amount of blood-tinged discharge is normal, particularly during the first few days. Remove dried discharge with a warm, damp washcloth. Hold the washcloth against the incision for a few seconds, and then gently wipe away the discharge. Place a blanket or towel over the bed, because dogs are very prone to vomiting after surgery due to the effects of the anaesthesia. Also, many dogs will urinate in their sleep. Your pet will be sleeping very deeply due to the after-effects of anaesthesia and she may experience sleep incontinence, particularly if she received IV fluids during the procedure. The nausea and the dog’s refusal to eat and drink should disappear within 24 hours after surgery. If your dog is vomiting and still refusing to eat and drink 24 hours later, consult your veterinarian. Signs of an infected incision or another problem include: A gap between the edges of the incision, Redness, Swelling, Pus discharge, A large amount of discharge, An odour, Bleeding, especially after the first 36 hours post-surgery, Pale gums,Torn stitches, Dislodged staples or an Open incision, Excessive panting or vocalizing due to pain (especially beyond the first 12-24 hours post-surgery). Take a daily photograph of the incision; compare the photos. This will enable you to monitor healing without relying on memory. If the redness, swelling, discharge, or general appearance of the wound is looking worse with time, this signals an infection! Get your dog to the veterinary clinic immediately. 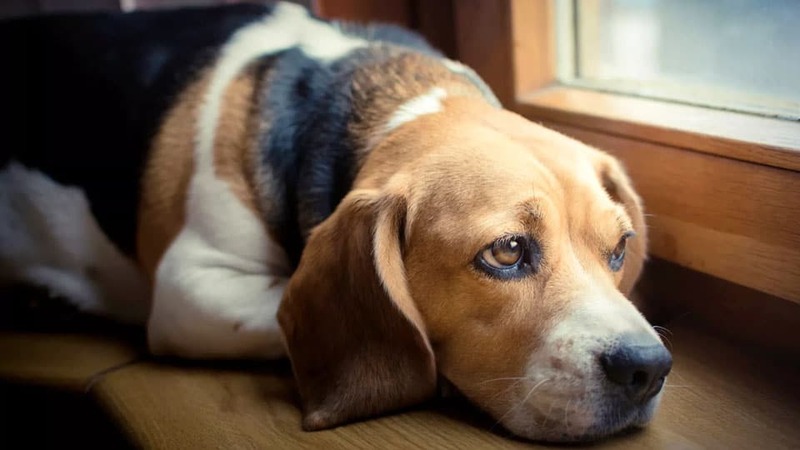 Are dogs prone to depression? Dog depression symptoms are very similar to those in people. Dogs will become withdrawn. They become inactive. Their eating and sleeping habits often change. They don’t participate in the things they once enjoyed. But this could also mean that a dog has a medical problem. So, the first course of action should always be a full check-up by a veterinarian. A pet that mopes around and no longer wants to go for walks could simply have pain from arthritis. Reasons for depression could be a major change, like moving into a new home, a new spouse or baby in the household, or adding another pet. Even a change in the dog’s schedule, for instance a stay-at-home owner who takes a job. The two most common triggers of severe dog depression are the loss of a companion animal or the loss of an owner. Most dogs bounce back from depression within a few days to a few months with just a little extra affection, Keep them engaged, do more of the things they like to do, get them a little more exercise and they should be fine. Reward them when they show signs of happiness. If the only thing that still gets a little tail wag out of your dog is a car ride, then take him for a series of short rides each day, praising and rewarding him when he appears happier. Medications for depressed dogs are the same as those used by depressed humans — Paxil, Prozac, and Zoloft. Clomicalm is sometimes used for the treatment of separation anxiety in dogs. But I would not recommend drugs, as these can often cause kidney failure. Change in eating habits. Most depressed dogs eat less; some refuse food. Oversleeping. Although dogs average about 14 hours of sleep per 24-hour cycle in a series of naps, some depressed dogs may find it hard to get out of bed. If you leave your dog for work and he continues to sleep after you get home, barely reacting to your presence, something is probably wrong. Destructive and/or aggressive behaviour. Usually affecting normally calmer dogs, this usually suggests the pet isn’t getting enough exercise. Seeming “lost” at home. Particularly following the loss of a family member, some depressed dogs pace room-to-room looking for that individual. Others no longer engage in normal “greeting behaviours” when family members come home. These behaviours may be accompanied with whining or sighing. Paw licking. Excessive licking or chewing may be rooted in physiological or psychological issues. Depressed dogs will often lick or chew their paws to soothe themselves. Avoidance and hiding. This kind of behaviour typically means one of two things: illness or injury (with depression falling under the “illness” category). Dogs that suddenly hide, or want to be left alone, behave that way because something is bothering them. If it’s not physical, it’s likely emotional. What is the punishment for stoning animals? As per Section 11 of Prevention of Cruelty to Animals Act, 1960, stoning, beating, kicking, over-riding, overloading, over-driving, torturing or otherwise treating any animal so as to subject it to unnecessary pain amounts to cruelty on animals. And whoever indulges in an act of cruelty to animals makes himself liable for action under Prevention of Cruelty to Animals Act.